The discovery of the bright ring of orbiting the star HD 115600 changes everything, said Thayne Currie of the Subaru Telescope, a Subaru Project Fellow research astronomer. "It's kind of like looking at our solar system when it was a toddler." 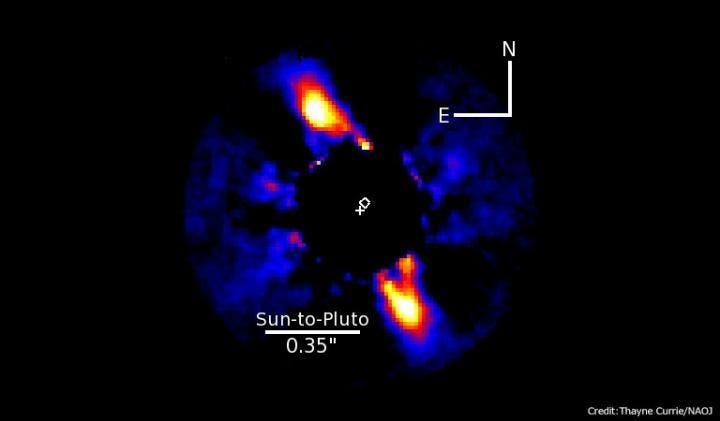 An international team led by Currie using the Gemini South telescope, has discovered a young planetary system that shares remarkable similarities to our own early solar system. Their images reveal a ring-like disk of debris surrounding a Sun-like star, in a birth environment similar to the Sun's. The disk appears to be sculpted by at least one unseen solar system-like planet, is roughly the same size as our solar system's Edgeworth-Kuiper Belt (commonly called the Kuiper Belt), and may contain dust and icy particles. This work provides a valuable key to understanding the early formation of the Sun and planets. Remarkably, the ring is almost exactly the same distance from its host star as the Kuiper Belt is from the Sun (Figure 1), and it receives about the same amount of light. The star itself is just slightly more massive than the Sun and is a member of a massive grouping of 10- to 20-million-year-old stars called the Scorpius-Centaurus OB association. Its birth cloud is very similar to the nebula in which the Sun formed some 4.5 billion years ago. There are strong indications that the ring around HD 115600 is being shaped by interactions with an unseen solar system-like planet. The team measured the position of the ring with respect to the star and found that the ring was significantly offset and has an eccentric shape (meaning that it's not very circular). This is likely due to the gravitational effect of a massive planet. The calculated eccentricity of the disk is among the largest known thus far, possibly more than the ring around the planet-hosting star Fomalhaut (which has at least one planet). By using models that predict how planets of different masses and orbital separations shape a debris disk, the team calculated what kind of planet might be distorting HD 115600's ring. They found that eccentric versions of planets much like Jupiter, Saturn, Uranus, or Neptune could explain the shape and other properties of the ring. Other clues suggest that the ring may have a composition similar to the Kuiper Belt. Its spectrum implies some types of dust, as well as major Kuiper Belt constituents such as ice and silicates. When compared with other debris disks, this one is much more efficient at scattering starlight, which implies it has a higher-reflecting, ice-like composition. The discovery of the ring was made using the Gemini Planet Imager (GPI), an instrument dedicated to detecting planets and Kuiper Belt-like disks at never-before-seen scales. It is similar to the Subaru Coronagraphic Extreme Adaptive Optics (SCExAO) instrument currently being commissioned on the Subaru Telescope. The results are very promising. "Even in just one of our many 50-second exposures, we could see what previous instruments failed to see in more than 50 minutes," Currie said. "Given this success with GPI, I'm very optimistic that Subaru's own, state-of-the-art planet-hunting instrument, SCExAO, will soon discover many Kuiper belt-like disks and young planets and will put us well on our way towards seeing another Earth." Located just beyond Neptune's orbit, the Kuiper Belt contains numerous icy dwarf planets such as Pluto, Haumea, and Makemake. It is also home to thousands of remnants from the earliest stages of icy planet formation, and thus provides a key to understanding the early solar system. The study of cold, Kuiper belt-like debris rings around nearby young Sun-like stars provides the best picture of what our own early, outer solar system might have been like. However, the few such rings that have been imaged so far haven't always been similar to ours. They usually surround stars much more massive than the Sun, or lie at greater distances than the Kuiper Belt, or are located in sparse star-forming regions unlike the massive and populous region in which the Sun was born. Until now, studies of these disks lacked the scattered-light spectra needed to explore them. Such studies can tell give information about the structure of the ring, as well as its motions. The paper reporting these results is accepted for publication in The Astrophysical Journal Letters with a title "Direct Imaging and Spectroscopy of a Young Extrasolar Kuiper Belt in the Nearest OB Association"
Our 30-Light-Year Voyage Through the Milky Way's Local Interstellar Cloud — "Fascinating Hints"